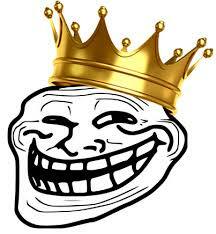 I am hoping the selectors will realize their error and pick Saini and dump DK who is not going to play AT ALL. Virat's captaincy at the moment is looking like biggest issue for India. This guy gives no confidence. Some of the folks here are going overboard. This is a good selection and thank them that they didn't take Rayudu. India will not be playing 3 seamers + Pandya in match. Jadeja will play as AR if all 3 seamers are going to play which is less likely. Pandya is better than the likes of Khaleel, Shardul, Inconsistent Umesh. And realistically taking Navdeep Saini to WC is just like taking a chance. Kohli at 4 is suicide.. Might as well not play the WC..
Agree that DK wasn't necessary... Could have picked Saini ahead of DK.. Rest of the squad looks fine to me. What’s wrong with Virat at 4 ? He’s done nothing of note at three in last 3 years . Has choked under pressure very often . Honestly as much as I feel sorry for Rayudu, Indian team never had a plan for that #4 spot. Instead they left it to the hypothetical plan of KLR #3. I know Kohli is trying to promote his mahaanta by dropping himself but it's not gonna help him. There's a 50-50 chance we might get kicked out in group stage itself. About Pant vs Kartik, I was pretty sure Pant was going. Unpopular opinion :that #4 spot was reserved for Yuvi. They had to scramble once he played like ****. Totally screwed up squad because a 38 yr old megalomaniac, who has done nothing in WCs outside Asia, is hell bent to prove his critics wrong (has been trying for 3 years now and failing). He’s already lost us a dozen+ ICC tournaments but is not done yet. And to that joker MSK Prasad, who said DK is a better keeper than Pant, someone should ask why then Pant and not DK is the Test keeper. He is an incompetent incorrigible liar. ---- What is the need for 3 specialist spinners in England ? now if one pacer gets out of form, they have to ask hardik and vijay to cover him up. i think they l play 1 spinner and 3 pacers and hardik and vijay will complete 4th pacer overs. it could be 2 pacers and hardik and vijay and 2 spinners. Dhoni is in great form this year and a much better option than hit or miss DK and slogger Pant.this isnt T20 cricket,you need an ability to build innings if wickets fall and i dont trust DK and Pant at all. That i agree. More often than not, one day matches are lost due to lack of basic common sense and clear head. Laying it out graphically, here is the squad. This is how the playing XI is likely to be selected too. A much younger Dhoni was in equally great form before 2007 WC, 2009 CT, 2013 CT, 2015 WC, 2015 WC and 2017 CT.
It’s a bit like Miandad playing the 96 WC, selected for experience, but ended up hurting his team badly. 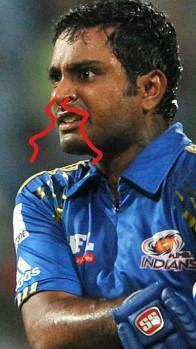 Karthik made debut in 2005 I think. Was not part of the world cup 2007, 2011, 2015 lol suddenly part of 2019 world cup squad. I am not sure anyone has made it to the world cup side for the first time after missing 3 world cups. Looks like that vampire worms from the Strain entering Dud. Mystery solved as how he made it into the 15. The ICC should allow 16 man squads for the WC. This would help most teams balance their squads. We still do not know how the pitches and the weather will behave but history is on the side of batters. Our batters needs to be in good form, and our lower middle must contribute in the days the top order fails.. As far as the bowlers are concerned, I feel barring injuries we should be fine. They wanted a good 12th man who will come and field and that's how Jaddu fits in. My only issue is Pants omission. The world cup would have been a good experience for him and would have helped him mature quickly.. We have already invested in him, and it was time to show the faith in him. Playing kulcha together is the way to go in England ,they complement each other well . I wont read too much from their form recently in India especially the IPL, it's clear they tend to struggle a bit where the bounce is less but away from home in SENA conditions they absolutely enjoy bowling due to the extra bounce and pace off the wkt . These guys destroyed aus,nzl, saf in their home, I'll go by that form . how did they enjoy bowling in England last time in ODIs? Dhoni was in magnificent form after hitting the trundlers in IPL and there was a sense of belief that the old thaila was back but all that was hogwash and it came crashing when he crapped in intl cricket that year in t20s and odis. If you trust dhoni to save our team in the WC you are badly mistaken ,dhoni has been past it for about 3-4 years now with the odd flame going up here or there. The only utility if dhoni is in the field and with the gloves and also when the team is In crunch situation chasing a sub 250 target (which I doubt due to the flat pitches of England) . Did very well till the last odi . In the 2nd odi England were 80 odd for no loss with a great start and then reduced to around 230 odd for 6 ,from there the death bowlers and willy did kabada for us else we should have hot them under 290 and that total would have been chased by most sides . They didn't have backup from the quicks to maintain pressure on the batsmen. This time it will be there as Bumrah & shami are both there. 40 overs of bowling will win us games. DK might be a lucky charm, he played in 2007 WT20 and 2013 CT, time to get the missing medal in his cabinet . According to this....all selectors wanted Pant except one person who had strong support from one senior Indian player. Now that team has been selected, we must look to optimise the resources. 3. No power hitter at no 5. If﻿ we lose an early wicket, then Vijay Shanker should come at 3 and Virat at 4. Vijay Shankar is better at playing swinging ball then K L ﻿Rahul. Exactly what vaughan said.Pant's exclusion is a massive fail. We dont have left hander in middle order and we dont have the explosive ower in middle order to make/chase 330 plus scores in belter pitches. This world cup is gone probably seeing dhawan and rohit's form have also taken an inconsistent turn of late. Among those selected, Dhoni, Rohit, Dhawan, DK, Jadhav, Bhuvi, Shankar, Shami, Jadeja and most likely Chahal will all be gone by the next world cup in India. Only Kohli (if he survives the disappointment of not winning a WC as captain), Rahul, Hardik, Kuldeep and Bumrah will remain. Such a thoughtless selection without any vision. For comparison, even 2015 squad was better. Dhoni, Kohli, Rohit, Dhawan, Rohit, Jadeja, Shami and Bhuvi - the core of this world cup's group were there as well. 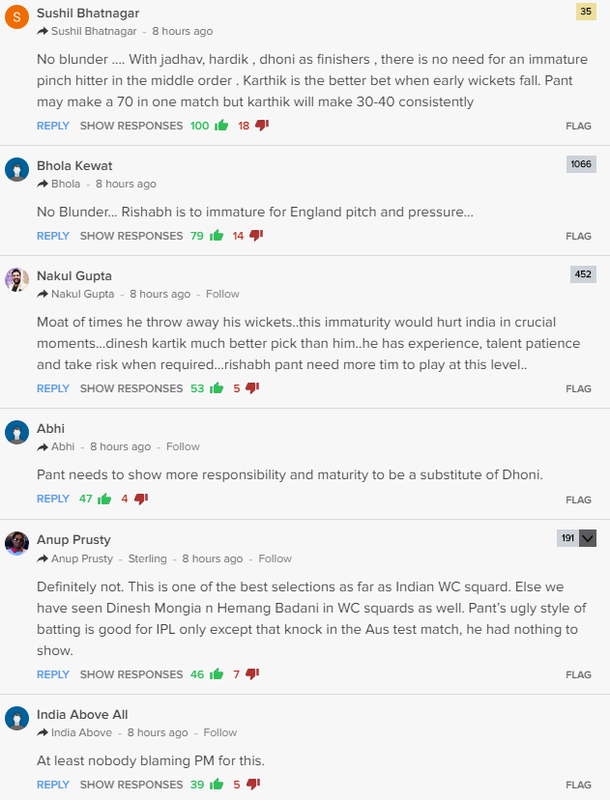 Reading the comments there is not much SYmpathy for Pant from fans. Kohli is a legit part of selection process. They would not have to hide his name and say a senior player in the team. If what was said true lol he would be the obvious suspect. Having said that he was never going to replace DHoni as long as he is around. I would put karthik's selection on more on Selectors uselessness than on any one player or captain wishes. Pant to be fair has not looked anyway near ready , he looks such a hit and miss. I still would have slected him. KKD in all likelihood will not be in the playing XI ahead of either Rahul or Shankar. Wouldn't surprise me if most of these "fans" were Dhoni nut huggers.